The Achaean League (Greek: Κοινὸν τῶν Ἀχαιῶν, Koinon ton Akhaion 'League of Achaeans') was a Hellenistic-era confederation of Greek city states on the northern and central Peloponnese. The league was named after the region of Achaea in the northwestern Peloponnese, which formed its original core. The first league was formed in the fifth century BC. The second Achaean League was established in 280 BC. As a rival of Antigonid Macedon and an ally of Rome, the league played a major role in the expansion of the Roman Republic into Greece. This process eventually led to the League's conquest and dissolution by the Romans in 146 BC. Reverse of the Achaean coins probably depicting the symbol of the league (right). Silver tetrobol issued under the Achaean League circa 175–168 BC. Obverse: Laureate head of Zeus right; Reverse: AX monogram, lyre above, ΔΩ - PO in left and right fields; Size: 15mm, 2.27 g; Reference: BCD Peloponnesos 27.1; McClean 6431-2; Benner 4; HN 225 var. ; Sear 2971 var. The League represents the most successful attempt by the Greek city states to develop a form of federalism, which balanced the need for collective action with the desire for local autonomy. Through the writings of the Achaean statesman Polybius, this structure has had an influence on the constitution of the United States and other modern federal states. The first Achaean League became active in the fifth century in the northwestern Peloponnese. After the catastrophic destruction of the ancient capital Helike by an earthquake and tsunami in 373 BC, it appears to have lapsed sometime in the fourth century. The regional Achaean League was reformed in 281/0 BC by the communities of Dyme, Patrae, Pharae and Tritaea, joined in 275 by Aegium, which controlled the important sanctuary of Zeus Homarios. The league grew quickly to include the entire Achaean heartland, and after a decade it had ten or eleven members. The key moment for the League's transformation into a major power came in 251, when Aratus, the exiled son of a former magistrate of Sicyon, overthrew the tyranny in his native city and brought it into the Achaean League. Since the Sicyonians were of Dorian and Ionian origin, their inclusion opened the League for other national elements. Aratus, then only twenty years old, rapidly became the leading politician of the League. In the thirty two years between 245 and his death in 213, Aratus would hold the office of general a total of sixteen times. 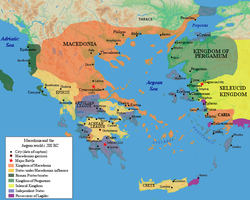 At this time, Central Greece and the Peloponnese were dominated by the Macedonian Kingdom of Antigonus II Gonatas who maintained garrisons at key strategic points such as Chalcis, Piraeus and Acrocorinth, the so-called "fetters of Greece". In other cities of the Peloponnese, namely Argos, Orchomenus, and Megalopolis, Antigonus had installed friendly rulers who were perceived as tyrants by the Achaeans. Aratus, who had lost his father by the hands of such a man, called for the liberation of these cities and secured financial support for the League from Ptolemy II of Egypt, an enemy of the Antigonids. He then used the money to challenge the Macedonian hold on the Peloponnese. Aratus' greatest success came when he captured Corinth and the fortress of Acrocorinth in 243 BC in a daring night attack. This effectively blocked Macedonian access to the Peloponnese by land, isolating their allies at Megalopolis and Argos. In light of this success, a number of Greek communities, including Epidaurus and Megara joined the League and Ptolemy III increased Egypt's support for the Achaeans, being elected as the League's hegemon (leader) in return. Antigonus Gonatas finally made peace with the Achaean League in a treaty of 240 BC, ceding the territories that he had lost in Greece. The increased size of the league meant a bigger citizen army and more wealth, which was used to hire mercenaries, but it also led to hostility from the remaining independent Greek states, especially Elis, the Aetolian League and Sparta, which perceived the Achaeans as a threat. Corinth was followed by Megalopolis in 235 BC and Argos in 229 BC. However the league soon ran into difficulties with the revived Sparta of Cleomenes III. Aratus was forced to call in the aid of the Macedonian King, Antigonus III Doson, who defeated Cleomenes in Sellasia. Antigonus Doson re-established Macedonian control over much of the region. In 220 BC, the Achaean League entered into a war against the Aetolian League, which was called the "Social War". The young king Philip V of Macedon sided with the Achaeans and called for a Panhellenic conference in Corinth, where the Aetolian aggression was condemned. After Aratus's death, however, the League joined Rome in the Second Macedonian War (200-196 BC), which broke Macedonian power in mainland Greece. The Achaean League was one of the main beneficiaries. Under the leadership of Philopoemen, the League was able to finally defeat a heavily weakened Sparta and take control of the entire Peloponnese. The League's dominance was not to last long, however. During the Third Macedonian War (171–168 BC), the League flirted with the idea of an alliance with Perseus of Macedon, and the Romans punished it by taking several hostages to ensure good behavior, including Polybius, the Hellenistic historian who subsequently wrote about the rise of the Roman Republic. In 146 BC, the league's relations with Rome completely collapsed, leading to the Achaean War. The Romans under Lucius Mummius defeated the Achaeans at the Battle of Corinth, razed Corinth and dissolved the League. G.T. Griffith has written that Achaean War was "a hopeless enterprise for the Achaeans, badly led and backed by no adequate reserves of money or men." Lucius Mummius received the agnomen Achaicus ("conqueror of Achaea") for his role. The government of the league consisted of an assembly of citizens, a smaller council, and a strategos (general). The Strategos (general) controlled the league's military forces. Originally, two stretegoi held office simultaneously, but from 251, there was only one, who was elected annually by the assembly. Until 217 the strategos entered office in May, afterwards he assumed power at the beginning of winter. Individuals could hold the office more than once (and frequently did so), but not in consecutive years. The general was assisted in his duties by a board of ten demiourgoi, a secretary, a hipparch (cavalry commander), a navarch (admiral), and hypostrategoi (sub-generals commanding in military districts). The office of Hegemon (leader) was given to various Antigonid and Ptolemaic kings at various points in Achaean history. Ostensibly, the hegemon had ultimate command on land and sea, but in fact the office seems to have been an honorary position which obliged the holder contribute money to the League and support the League's military ventures. Ultimate decision-making power rested with the assembly (synodos), which was held at Aegium four times a year. All male citizens of communities belonging to the League were entitled to attend. Alongside the assembly there was a council (boule), which was open to citizen men over thirty years old. Special meetings (synkletoi) had to be called in order for the league to declare war, form an alliance, or receive official communications from the Macedonian king or (later) the Roman Republic. The league was ostensibly a democracy, but control seems to have consistently rested with a small elite group who monopolised the generalship and other official positions. Given the difficulty of travelling to Aegium, assemblies were probably dominated by the wealthy. The Achaean army was an army of the traditional hoplite type. From the 270s onwards however, much like the rest of Greece, the emergence of the Celtic shield known as the thyreos was incorporated into Greek warfare and a new type of troop was developed. Reforming their troops into thyreophoroi, the Achaean army was now composed of light troops. The thyreophoroi were a mixture of evolved peltasts and light hoplites, carrying the thureos shield, a thrusting spear and javelins. Plutarch says that they could be effective at a distance, but in close combat the narrow thureos shield disadvantaged them. He also says that their formation was ineffective, because it lacked inter-locked shields or a ‘leveled line of spears’. Aratus, one of the major Achaean strategoi (generals) and statesmen was known for his use of light forces for irregular operations, a type of warfare suited to the thyreophoroi but not suited to operations in the open field. The League in 217 decided to maintain a standing force of 8,000 mercenary foot and 500 mercenary cavalry, added to a picked citizen force of 3,000 infantry and 300 cavalry, of which 500 foot and 50 horse would come from Argos and the same amount from Megalopolis. Aratus also obtained 500 foot and 50 horse each from Taurion and the Messenians for defence of parts of the League open to attack via Laconia. The citizen infantry would have been armed as thyreophoroi, apart from the citizen light troops who would have been archers and slingers etc. This picked citizen force may well have existed before these so-called reforms, at least on an official basis, as we know of a similar elite force of the same size at the Battle of Sellasia in 222. However, it was the Achaean general Philopoemen in 208 who changed the Achaean fighting style and weaponry to the Macedonian fashion. According to Plutarch, Philopoemen ‘persuaded them to adopt long pike and heavy shield instead of spear and buckler, to protect their bodies with helmets and breastplates and greaves, and to practice stationary and steadfast fighting instead of the nimble movements of light-armed troops’. These ‘reforms’ were not necessarily new to some of the constituent cities of the League, as the city of Megalopolis had been given bronze shields and armed in the Macedonian fashion by Antigonus Doson for the Sellasia campaign many years before. Philopoemen then trained the new army how to fight with the new weapons and tactics and how to co-ordinate them with a new mercenary corps that was hired. He spent nearly 8 months of his term as strategos visiting, training and advising cities in this capacity. At the Battle of Mantinea in 207 BC the Achaean phalanx was positioned with intervals between the companies with lighter troops. This was obviously a major attempt by Philopoemen to increase the flexibility of his phalanx. He may have picked up this tactic too from his experience at the Battle of Sellasia, where the phalanx of Antigonus Doson was also divided up with light/medium troops in between them. As well as reforming and re-organizing the infantry, Philopoemen also reformed the citizen cavalry. The cavalry was recruited, much like in other Greek states, from the rich and noble classes. Philopoemen organized the cavalry in lochoi, which usually in ancient military treatises means ‘files’, most probably of 8 men, grouped into dilochiai, a formation of double-files of 16 and so forth. However, by the time of the Achaean War in 146 BC, the League's army had decreased in strength and efficiency. The League was even reduced to freeing and arming 12,000 slaves. This was probably due to the 2nd century BC decline in population. This may well account for the increased hiring of mercenaries, especially Cretans and Thracians. Territory of the Achaean League in 200 BC (excluding Boeotia). The below are the original Peloponnesian members, except the ancient regions of Sparta, Elis and Messenia. Later Hypana in Elis, Corone, Messene, Sparta and Pagae in Attica were joined by conquest. 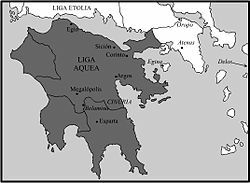 In 223 BC, Megara in Attica deserted the Achaean League and joined the Boeotian Confederacy. Besides many city-states on the Mainland joining the Achaean Federation, certain Mediterranean island city-states also became part of the federation. For example, Kydonia on Crete joined at some time after 219 BC. The city of Helike had been an important member of the first Achaean League, but sank into the sea following a disastrous earthquake in 373 BC. The town of Olenus, also one of the twelve members of the first Achaean League, had been abandoned before 280 BC, but was sometimes counted as though still extant. The dates in brackets indicate the year of first adhesion. Some cities had periods of separation or foreign occupation and later joined again. ^ Walbank, Frank W. “Polybius and the Roman State.” Greek, Roman, and Byzantine Studies 5 (1964): 239–60. ^ a b P.J. Rhodes, p.6. ^ According to Errington, the reform was probably requested or influenced by Philip V of Macedon. At the time of Philopoemen's election, Philip was in a full-scale war and could not support or finance the League. He realized that the League had to become militarily self-sufficient but also kept in the Macedonian sphere, lest the Achaeans join Macedon's rivals. Philip V probably supported Philopoemen for strategos for the year 208/07 and in doing so was able to get what he wanted (Errington 1969, p. 63). ^ Errington 1969, p. 64. Adams, Winthrop Lindsay (2010). "Alexander's Successors to 221 BC". In Roisman, Joseph; Worthington, Ian. A Companion to Ancient Macedonia. Oxford: Wiley-Blackwell. pp. 208–224. ISBN 978-1-4051-7936-2. Benner, Steve M. (2008), "Achaian League Coinage of the 3rd through 1st Centuries B.C.E. ", Classical Studies no. 7, CNG Inc.
Walbank; Astin; Frederiksen; Ogilvie (1984), The Cambridge Ancient History, Volume VII, Part I"
Wikimedia Commons has media related to Achaean League. "Hannibal and the Punic Wars". Archived from the original on 9 April 2004. "Achaean League". Columbia Encyclopedia (6th ed. ).